Ever since first opening its doors in 1960, Hickstead has held a special place in the hearts of equestrians and spectators across the globe, drawing excited crowds year-on-year and satisfying their appetite for occasion. The first permanent ground for equestrian sport, Hickstead is now thought of as the home of British show jumping and also carries the torch for international competition, commanding a huge global audience. Owned and opened by multi-millionaire Douglas Bunn – a keen show jumper who later became known as ‘The Master of Hickstead’ – on a site known only as Hickstead Place, today the world-famous venue in West Sussex is host to some of the most renowned international level competitions, including the Longines Royal International Horse Show and the British Jumping Derby. The early Hickstead was brought to life by Bunn, whose passion for show jumping echoed in everything he tried to achieve at the venue – once no more than just a small Sussex field. In the late 1950s Bunn travelled to Europe to compete and was astounded by how much Britain lagged behind; the facilities in some European countries for hosting top international shows were far superior to what Bunn was used to and left Britain playing catch-up. On his return, Bunn vowed to create a venue Britain could be proud of and one whose facilities rivalled even the most established show grounds on the Continent. In May 1960, Bunn opened Hickstead and embraced the masses that came to compete and spectate. It just so happened that the birth of the All-England Jumping Course coincided with the closure of Goodwood dressage venue, which perfectly accommodated the transfer. Evolving Hickstead was a venture unlike any other and Bunn invested time and money into getting the venue up to standard. In short, he strived for somewhere for top level British riders to test themselves over International-style courses, helping them gain experience and daring. 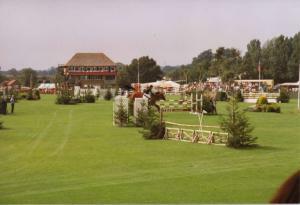 The initial plans for the venue began relatively modestly, but Bunn’s big ideas soon came to fruition and Hickstead grew into a course of champions. Not known for his conformist attitude, Bunn decided to create a Derby Bank that was nine inches taller than the Hamburg Derby – a decision that was met with horror by most of the competitors. Today, Hickstead carries a certain notoriety as one of the toughest competition grounds, but also as one of the most enjoyable to compete and spectate at. Hickstead is in fact one of the most eagerly anticipated events of the sporting calendar and continues to attract large audiences every year, with its fine displays of horsemanship and equestrian sport in action. Despite being threatened with closure in December 1996 when Silk Cut dramatically ended their sponsorship of the event, efforts were made and funds raised to ensure the venue soldiered on. The future of Hickstead now seems guaranteed with the current venue boasting six show arenas and seating for over 5,000 spectators. Following the founder’s death in 2009, the baton has been passed on to his children who are the brains behind the current operation, ensuring Hickstead retains its national and international status. If you are lucky enough to be attending Hickstead this year, we hope you have a great time! This week sees the start of another high profile event, the Royal International Horse Show, which VioVet is excited to be attending :) If you get the chance, come say hi to us on the Equitop Myoplast stand (stand 4)!